Chinese dumplings come in a huge variety of styles (see page 107 for a guide to different dumpling shapes). 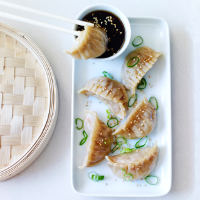 Vary the filling of these jiaozi (say: jyaoww-dzrr) with chopped raw prawns instead of pork. We’ve steamed these but you can make ‘potstickers’ by frying the base in oil for 2-3 minutes, until golden, then adding a little water to the pan, covering and steaming for 10-12 minutes. 6. Mix the sauce ingredients and serve with the dumplings, scattered with the reserved salad onion tops, and toasted sesame seeds, if liked.